The 2015 hockey season is now complete. Congratulations to state champions Lakeville North and East Grand Forks. Lakeville North had the first undefeated season by a large school in 22 years. Duluth East, in what might be a first, finished as the runner-up while allowing more goals (89) than goals scored (88) for the season. New section assignments for the next two years are set. There are substantial changes to sections 2AA, 3AA, and 6AA. 4AA acquires Woodbury but otherwise stays the same. Duluth Marshall will opt up to 7AA. A full list of schools opting up is here. Forty years ago, on March 6, 1975, Hill-Murray played its first state tournament game at the Met Center. Here are the highlights, with the call from Joe Boyle and Lou Nanne on WTCN. Many thanks to Tony and Dave Reif for sharing this priceless video. 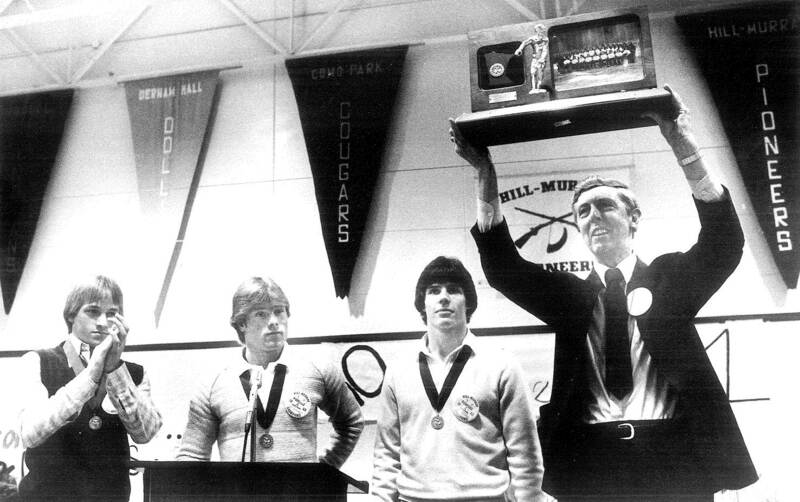 35 years ago and just two weeks after the 1980 Olympics, Hill-Murray qualified for the State Tournament with a double overtime win at the Auditorium. Both are chronicled in this pre tournament preview show. Highlights of the HM-Mariner game begin around the 15:00 mark. The 2015 tournament will be televised on KSTC Channel 45, and pay-per-view internet streaming is available. Hill-Murray will play a section semifinal at Aldrich Arena for the first time in 32 years. The last time, the 1983 Pioneers needed a goal with one minute remaining to dispatch Stillwater en route to a state title. Aldrich did host the Section 2AA semifinals as recently as 2002, but has never hosted a AA or one-class section final. It hosted the Section 4A final for many years. 4A is now at Roseville, the first playoff games in any round to be played at Roseville Arena since 1984. Feb 5 is Hill-Murray's first ever game at Hastings Arena. Until January, the two schools had never played each other, Hastings being the only AA school with any past hockey significance that Hill-Murray had not played. On the A side, Hill-Murray has never played Hermantown, a school which mirrors Hill-Murray's performance in that they are a frequent state tournament participant and have the most second place finishes. Here's a report that looks at the distribution of when goals are scored throughout a hockey game. It categorizes every goal over the past 12 seasons according to which minute of the game it was scored. HM Hockey: When do goals happen? For a sneak preview, here's a graph of the total goals by both teams by the minute. Video highlights of Hill-Murray's overtime win on the outdoor ice at the St. Paul airport broadcast on FSN. As many of you know, founding principal and legendary band director Frank Asenbrenner passed away last month. For decades, his pep band charged the atmosphere at all home hockey games. Here, Mr. A raises the 1983 championship trophy alongside captains Tom Follmer, Mark Krois, and Mark Horvath. Full schedule for this week's holiday tournament, plus link to live streaming of the games. Hockey Day is January 17. Get info from the sponsors here. Johnson is not much of a surprise; it is after all the second most common surname in the United States. However, there has been just one Smith (#1), Brown (#4), and Jones (#5), and no Williams (#3). Those 15 names represent 45% of the total, but as evidence that name diversity has been increasing over time, only 3 current Pioneers are represented on that list. Season 55 of Pioneer hockey is underway! New lockerrooms are under construction at Aldrich Arena. Hill-Murray will play another outdoor game, this one at the St. Paul Airport on January 17. Updates to hmpioneers.net since last season: a large table detailing playoff performance by all Minnesota high schools over the last 40 years. And some new info on individual scoring leaders and other historic feats is on the team records page.